Take the data entry out of tax preparation. Populate accurately extracts information from scanned client documents and inserts it into the leading tax preparation software, freeing preparers to focus on higher value activities. Unprecedented accuracy with GruntWorx’s patented Data validation services. Eliminate data entry with accurate data extraction and population into the leading tax preparation software packages. 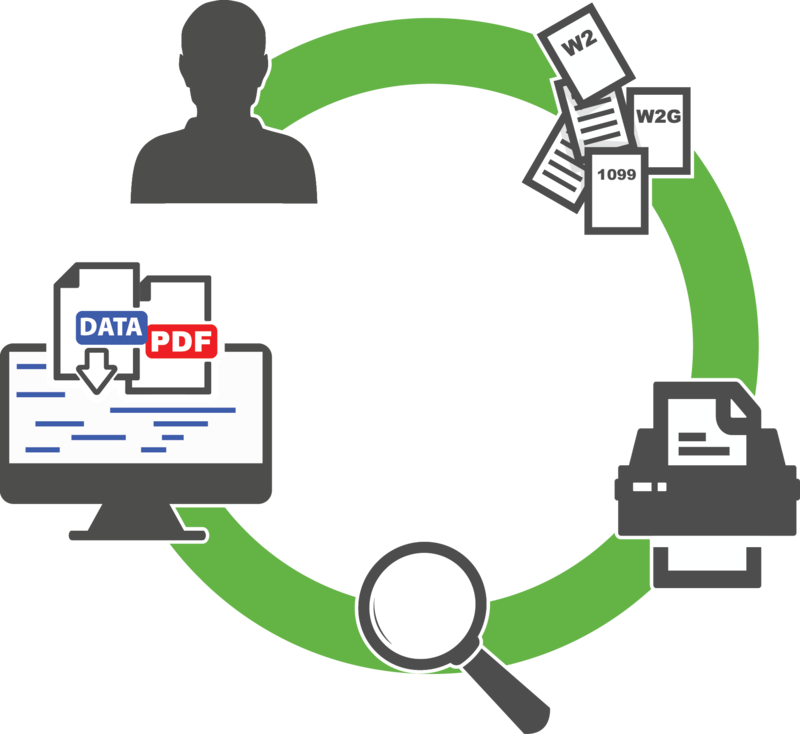 Simply scan stacks of client source documents and upload them to GruntWorx Populate. Using patented technology, GruntWorx Populate identifies and extracts information from thousands of tax documents with unparalleled accuracy. Reduce tax preparation time and increase efficiency. GruntWorx Populate eliminates data entry—saving time and minimizing the number of tax practitioners that touch the return from start to finish. Frees preparers, reviewers, and partners to focus on value added activities. GruntWorx Populate requires no knowledge of tax documents, making it easy for support staff to scan and upload source documents. Consistent tax document organization and data extraction for every client. Standardize data entry and review for even the most complex returns that involve multiple tax professionals. Tax workpapers are bookmarked in the same order every time—no matter what order the documents were scanned in. Patented technology identifies thousands of tax documents with best-in-class accuracy. Extracts data from scanned tax documents for import into the leading tax preparation software packages. Identifies, organizes and bookmarks scanned tax documents into a single PDF file that makes it easy to verify the accuracy of imported data. Secure web-based application that’s easy to use and easy to deploy within your existing workflow. GruntWorx Populate is currently available for integration with Drake Software, GoSystem Tax RS, ProSystem fx Tax, UltraTax CS and Intuit Lacerte. To learn more and register for a free demo, please contact GruntWorx sales at 1.877.830.6059 x2.